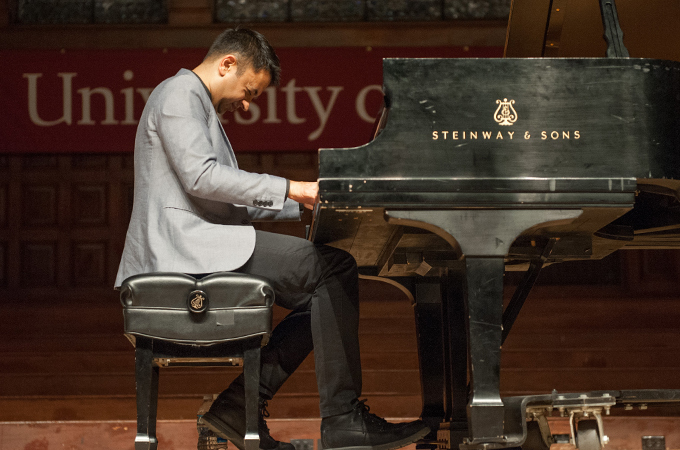 Melodic and entrancing notes filled the University of Redlands Memorial Chapel last Wednesday, as an intimate gathering of students, faculty, alumni, and community members were treated to a piano performance by preeminent composer and musician Vijay Iyer. The impressive set included both Iyer’s take on jazz classics by the likes of Duke Ellington and Billy Strayhorn, as well as a number of Iyer’s original pieces. The concert featured Iyer sitting at the piano, taking time between various pieces to give brief accounts of the context and history of the works he was interpreting. The intimate setting, simple presentation, and masterful playing combined to deliver a deeply emotionally impactful musical experience. In addition to his noteworthy career as a touring musician, Iyer has an impressive list of accomplishments and accolades. A Grammy nominee, Iyer was named a fellow of the MacArthur Foundation in 2013, prior to taking a position as the Franklin D. and Florence Rosenblatt Professor for the Arts at the Harvard University Department of Music. The artist himself, however, would likely brush past such accolades to discuss the impact and transformative potential of music in particular and art in general. Iyer’s thoughts on race are also intertwined in his experience of jazz music. As he explained, the history of jazz and the framework of oppression suffered by African American artists who pioneered the genre are inseparable. I had a chance to interview Iyer the day of his visit. You can watch the video below or on the U of R Facebook channel, where it was livestreamed. Learn more about the music program at the University of Redlands.